Recharge your heart and soul during our jam-packed calendar of festivals. Relive history during a Civil War reenactment. A festival celebrating sweet smelling Azaleas and southern belles ushers in spring. Indulge in craft beer events and trails, soar with the largest of kites oceanfront, or dine and dance at seafood and beach music festivals. Experience a winter waterland of holiday lights to close out the year. 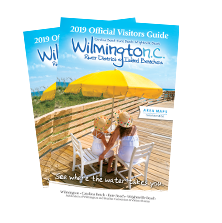 It’s a festival frenzy and many are only found here in Wilmington and our Island beaches!